I’ve been experimenting with tunnels for Scamp, here is a really easy to make newspaper tunnel…. Step 1: Lay out a row of sheets of newspaper, overlapping each sheet by approximately a third. I used 4 sheets. Step 2: Roll the paper around something round, such as a cake tin. I use a shop brought tunnel. Step 3: Roll over the ends to stop the tunnel unravelling. Fold outwards, like turning up trousers. You only need to fold over about an inch, do it twice to keep it secure. "Do I have too?" "Okay, but I'm going to pull a funny face." Of course, it’s easy to chew to pieces but it’s quick and free to make so shredding is just part of the fun. I used a local paper but if you pick something bigger like the telegraph you could get a lovely long tunnel. "Hi, can I have treats now?" This entry was posted on Saturday, October 2nd, 2010 at 12:49 am	and is filed under Toys & Enrichment. You can follow any responses to this entry through the RSS 2.0 feed. You can leave a response, or trackback from your own site. Humphrey will have one of those this evening. Something noisy to do while Mike is watching the bloody golf…. hahahahha! Ooohh that looks better than the store bought ones, because the floor of yours flattens out! My rabbits don’t use the store bought ones because they roll. Love these great toy ideas. My bunnies are playing with the toilet paper tube balls right now, trying to get at their dried banana treat inside! Took me all of 2 minutes to make 2. Thanks!! do you leave the cake tin or whatever in it? Hi Lauren, no take it out afterwards it just makes it easier to make the tunnel shape. I’ve spent the best part of 7 hours reading through everything on your blog, making notes of ideas and bookmarking pages ready for when I get my bunny on the 20th June. I honestly think this is the best Bunny Blog out there and you’ve inspired me to start writing my own when our little fluff ball arrives! Thank you so much! You’re very welcome. It sounds like your new arrival’s going to be a very lucky bunny you’ll be well prepared. 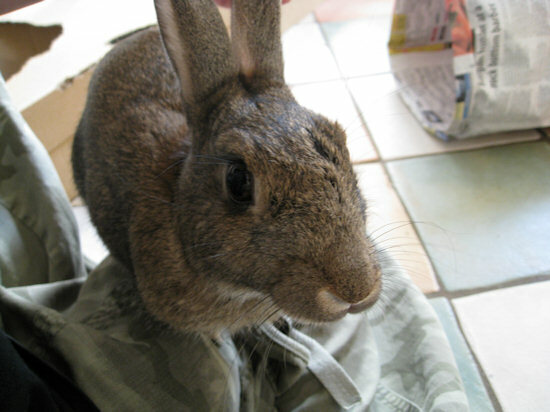 Send me a link when you get started – I like reading other bunnies blog’s too! You do, however, end up with lots of lopsided loose structures the bunnies love to explore and shred, so in a way it stimulated them in almost the same measure it frustrated us trying to get the whole thing to hold together without resorting to string… Makes a nice change to just flat newspaper in a box they’ve had to shred before! Cardboard balls were great, easy to make, but I’m holding those until tomorrow, when they 9and we) have recovered from their shred-fest! Ah well, I guess I’ll just have to invest in a tunnel after all. 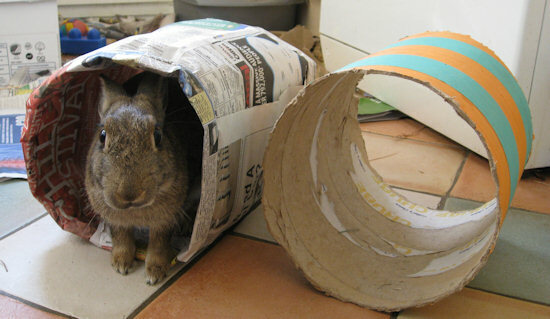 I like the tunnel to make with news paper what concerns me is the ink from the news paper is it safe to use as the rabbits chew on it is there a web site how to find out what news paper is best for rabbit ?